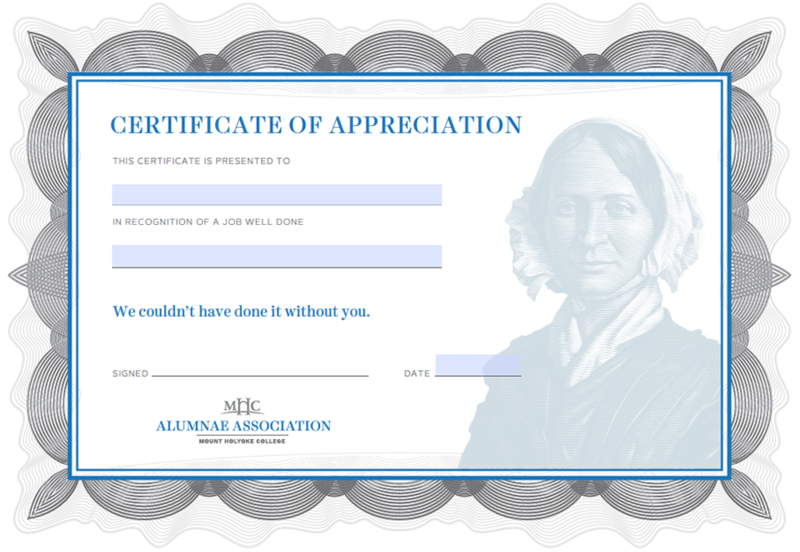 The Certificate of Appreciation is an easy, immediate, and thoughtful way to thank a Mount Holyoke College Alumnae Association volunteer for a job well done. Recipients should be alumnae identified as making a contribution, small or large, one-time or short-term, and do not have to be office holders (e.g., class, club, or group officer), committee members, or have specific volunteer jobs. It’s that simple—this should be used as a token of appreciation for giving of time and talent to the Association’s mission. Certificates can be downloaded and presented in person to the volunteer once the information form below is completed. Questions on use of the certificate should be directed to Jonencia Wood, senior director of alumnae engagement. Individually or as part of a group, participates in or leads a project, event, or other activity—small or large—and helps bring it to completion. Brings energy and creative ideas to a planning process, resulting in a new or more successful event or activity. Attends meetings and participates regularly and is willing to do whatever is necessary to make things happen. Does a particularly noteworthy job on a presentation or written product or event/group activity. Any opportunity beyond the scope of this listing to thank an alumna volunteer by presenting a certificate should be acted upon. Presenters will typically be a class, club, or group officer, or a board, committee, or Alumnae Association staff member. The presenter will print and fill out the certificate and submit the information form. The certificate should be printed on certificate stock paper and placed in a paper folder or frame to keep it flat. Certificates should be presented in person at a meeting or group gathering whenever possible. Certificates may be awarded to as many alumnae as should be recognized—there is no limit per project, event, activity, or time period. An alumna volunteer can receive more than one certificate in the course of volunteer service. Once you complete and submit this form, you may download the certificate.